Mix 5 grams of Creatine Micronized with water or juice either with a meal, post-workout or pre-workout. Continue the use of Creatine on non-training days as well to maintain muscle saturation. Creatine levels will decline and return to normal after 30 days. Creatine supplementation is also important for the elderly to support lean mass and functional strength. 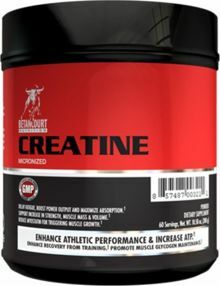 Creatine Monohydrate stands today as one of the most researched and effective stand alone supplements in the sports nutrition industry. Betancourt Nutrition's Creatine Monohydrate is manufactured in our NSF certified cGMP facility in Miami, Florida. This ensures that our facilities comply with all Food and Drug Administration regulations and requirements for the manufacturing of nutritional supplements. Every single raw material used in our products is identity tested before production at a minimum and all finished products are submitted to rigorous quality control and assurance processes and procedures prior to being released to inventory. Guaranteeing the quality and safety of every bottle of Betancourt Nutrition product continues to be at the core of our business and our vision. Increase strength by elevating creatine phosphate levels. The elevation of creatine phosphate leads to an increase in the formation of ATP. ATP is the form of energy that your body can use. It is also formed by carbohydrates and fat, however it is most quickly produced using creatine phosphate.